Is eating food worth it if you want to avoid being hungry? Because that's how clear the answer to this could be - unfortunately, content marketing in the manufacturing industry suffers from a number of mistaken impressions that are holding manufacturers back. Many, for example, think that content marketing for manufacturers isn't relevant, it's for exciting B2C companies, right? Wrong! Never underestimate the value of being an expert and trusted adviser in your industry. Sure, a manufacturing company’s blog isn’t ever going to excite the masses, but to your audience, content which solves their problems and answers their questions is hugely valuable. To be fair, blogging does have its drawbacks. For example, it's time intensive - any honest content marketer will tell you that it will probably be several months before you see a true profit, and you can't have a full-time marketing strategy without a full-time content creator, unless you plan on outsourcing to a trusted agency partner. Content marketing also suffers from an indirect connection to lead generation... and distribution challenges. Particularly in a sector such as manufacturing where it’s unlikely your content will ‘go viral’. To counter this, boosting your organic reach via tools such as targeted advertising via LinkedIn and other relevant channels is a cost effective solution. Of course, that's only part of the picture. Market research by HubSpot has found that marketers who focus on blogging are about 13 times more likely to see a positive return on their investment. Furthermore, blogging is a preferred marketing technique among B2B companies because of how helpful it is for educating customers. Content marketing in the manufacturing industry isn't nearly as hard as most people believe - not when you focus on creating blogs with a focus on helping the buyer and meeting their needs. This is the key detail that many people forget - when people are searching for blogs, they're usually looking for a solution to some problem. Offering advice and knowledge which ultimately ends in providing a solution to their problem makes it drastically more likely that they'll become a customer. It doesn't matter how good your blog is if nobody sees it. Distributing it across multiple channels - social media is a popular choice - makes it much easier for people to find and link to. Aside from your direct followers, you’ll also need to consider targeted advertising via these channels to boost the reach of your content to new prospects. Most people need to be prompted to take the next step. You can't just give potential customers advice - you have to tell them what to do next if you really want them to act. People reading a manufacturing blog are looking for information – as mentioned earlier, it could be a solution to a problem, a gap in their knowledge or need to improve something. Use your calls-to-action to signpost readers to premium content offers such as eBooks, whitepapers, buyers guides and checklists. These not only provide a method to convert blog visitors to leads via a data capture form, they make your prospects more informed, making the sales process easier, whilst positioning your company as a trusted adviser and expert in your field. It's also important to keep in mind that blogging, by itself, is meant to be towards the top of the sales funnel. It's not really about converting customers - it's an effective method of generating relevant organic traffic and a tool to create awareness and interest - convincing your prospects to hear more of what you have to offer. 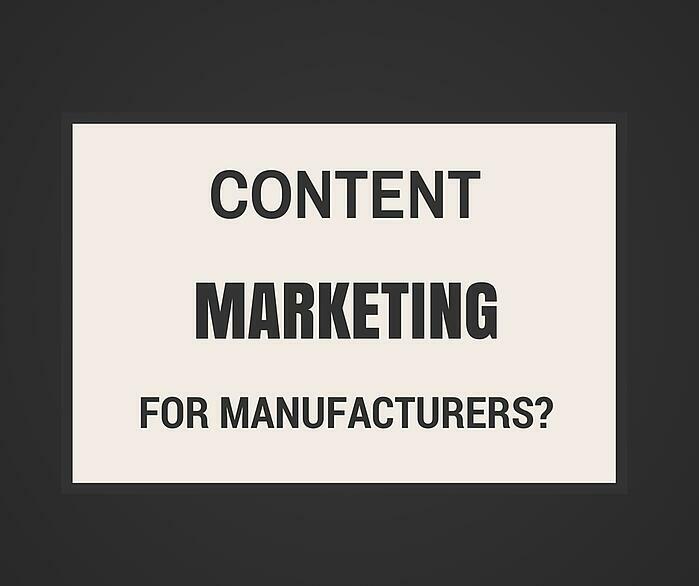 Now, proper content marketing in the manufacturing industry requires a significant investment in both time and cost. You'll need good marketing software such as HubSpot to underpin your digital strategy and staff to write your material and keep things on track. If you don’t have the resource in-house you may need to outsource things. It all sounds like a lot of hard work? Correct, but compared to traditional marketing channels, content marketing is significantly more cost effective, and the results speak for themselves. Take a look at the case of Claxton Engineering, the return on investment is outstanding. Yes, it's worth it. In fact, content marketing in the manufacturing industry is more than worth it because it offers such a great opportunity... and the current lack of competition in this field means that companies who move now can probably secure a leading position. Of course, you'll only realise the value if you take things seriously. A few ad hoc blogs a year won't have any real effect - but a proper investment in content marketing could quickly show a phenomenal increase in your number of leads.